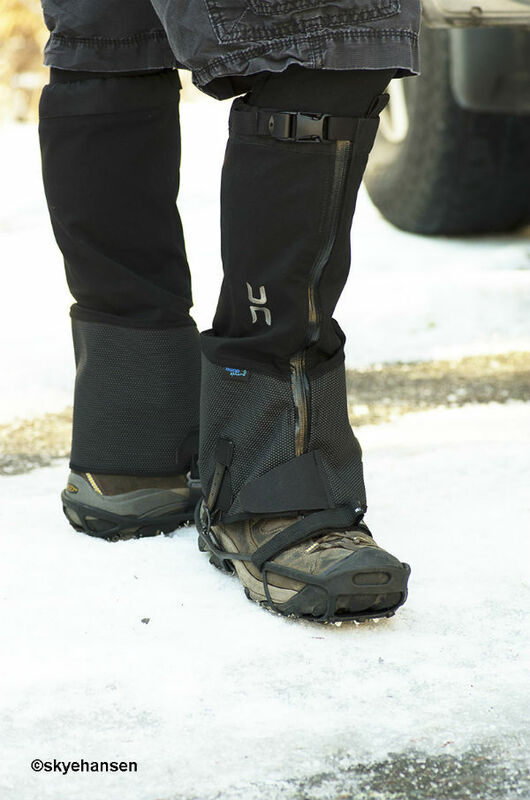 Hillsound Equipment Inc. (based in Vancouver, Canada), started out by designing and selling crampons and have now added a range of gaiters to their selection of products. The Hillsound Super Armadillo Nano Gaiters are top-of-the-line, pairing a stretchy waterproof fabric, called Schoeller C_Change®, with a lower armor called SuperFabric®. 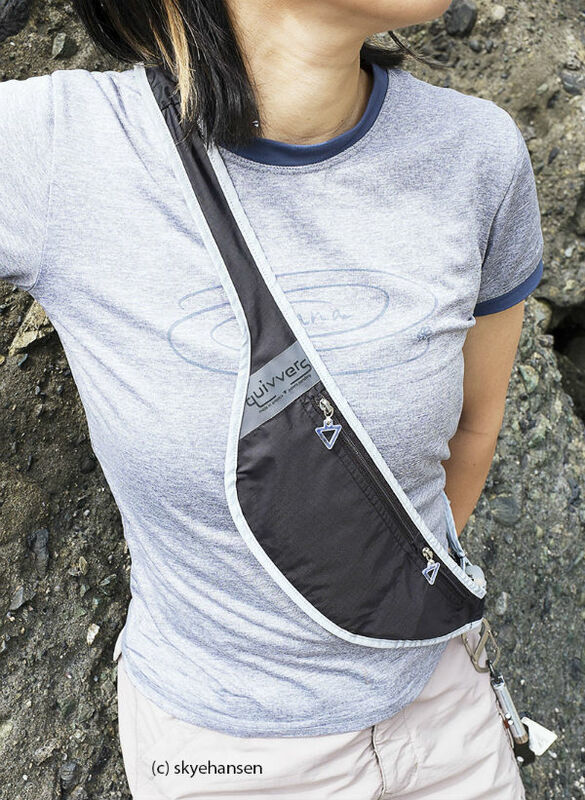 The stretchy fabric wraps comfortably and snugly around your calf, without restricting movement. Meanwhile, the SuperFabric protects everything from the ankle down, from sharp branches, thorns, and the occasional crampon puncture. I’ve been testing the gaiters for the past couple of months on the local hills in the area, in wind, snow, and rain conditions, and was interested to compare them to my 6-year-old, but still high-quality and serviceable (and still being sold at local hiking stores) gaiters from another company. I found a world of difference, starting with the less bulky look and fit. 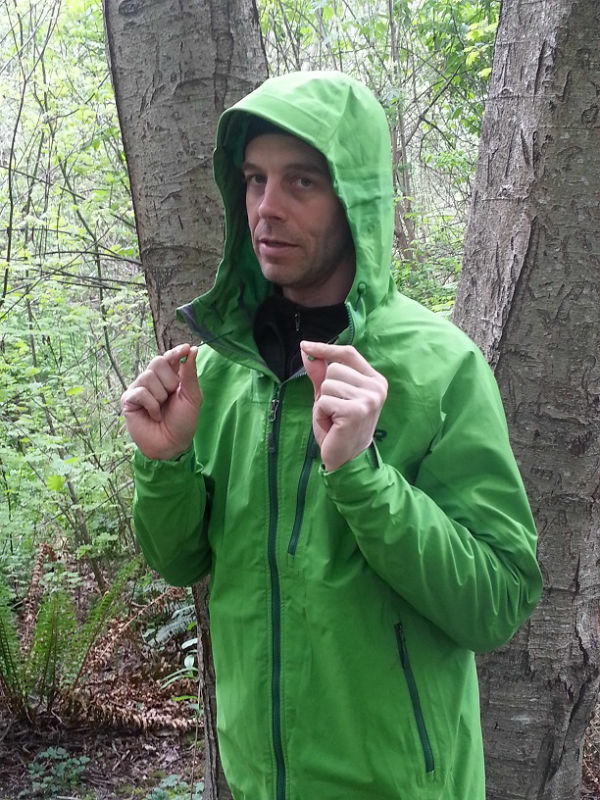 The gaiters join together at the top with a waterproof zipper. This is a little fiddly to mesh together in cold weather, but it ensures a secure and exact attachment without having to precisely line up a long expanse of velcro. 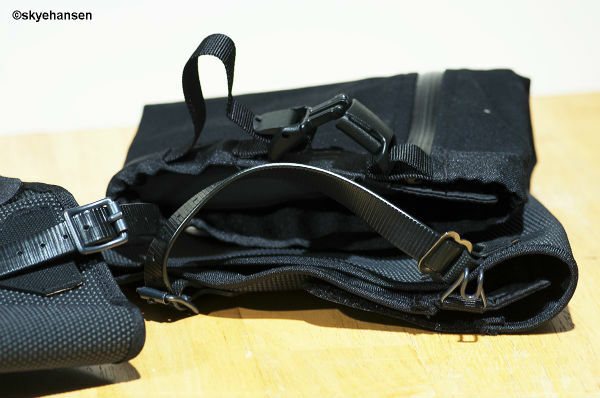 The fact that there’s very little velcro on the gaiters makes it very quiet to re-adjust or remove and decreases the risk of snagging on anything while being stored in your equipment bag. My calf narrows as it approaches my knee, so I found the “tightener strap” at the top of the calf to be a bit useless. The elastic part of strap wasn’t really stretchy enough to provide me with a secure feeling, but on the other hand, the gaiter is in no danger of sliding down my leg. The lace hooks are large, meaty affairs that hook onto your shoelace from underneath, which decreases the chance of the hook popping off during your adventures. Of course, the boot straps are replaceable. 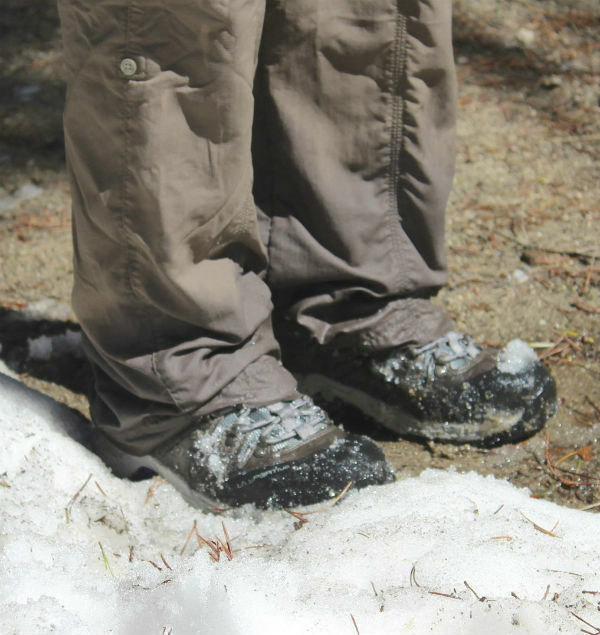 The gaiters do fit very comfortably, to the point where you can forget you’re wearing them for hours. In order to get this fit though, I had to try on a couple of different sizes. Although the gaiter sizes are listed according to your shoe size, it would have been fairer to list them according to calf width. I tried to fit a medium sized gaiter on 4 or 5 male friends with shoe sizes varying between 9 and 10, and had only limited success in attaching the zip at the top, in order to zip it down to the base. 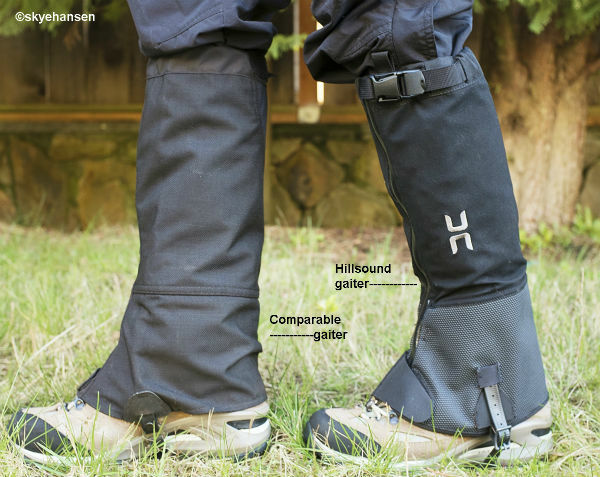 Once on, everyone agreed that they were warm and silent (occasionally, some lower-quality gaiters tend to rub against each other with a swishing sound, but these gaiters don’t rub and don’t make noise). It wouldn’t be a true test if I didn’t run around in ankle-deep underbrush, or splash around in every single river and stream I forded. 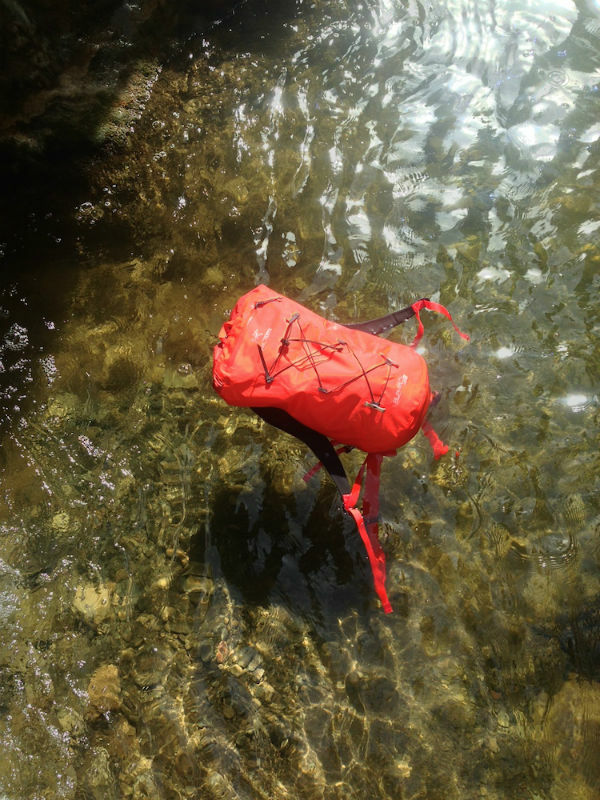 I would often find that while the material itself got damp, this moisture never transferred to my trousers, and the gaiter dries very quickly when I hang it up after the hike. I also found that in addition to shielding my ankles from branches, snow doesn’t stick to the SuperFabric, which is an additional benefit (the cold doesn’t transfer to my clothes and the rest of my body). Skye is a hobbyist photographer who fell in with the wrong crowd. A few years ago she was invited on her first car camping trip which was so enjoyable that before she knew it she was hiking more, camping regularly, and occasionally backpacking. She now spends her time obsessing over what magical combination of equipment would enable her to more easily achieve all of the above. Her favorite part about camping has always been toasted marshmallows, experimenting with a new s'mores combination, and coming home to that first shower.